The Andruss Library Special Collections has a concentration of books on the topic of Coal Mining (primarily anthracite) and the Molly Maguires. These include over 50 books about coal mining (mostly in Pennsylvania), over 25 books about the Molly Maguires, and 2 films about mining and the Molly Maguires. •	HD8039.M62 U6493 2006 "Another Civil War: Labor, Capital, and the State in the Anthracite Regions of Pennsylvania, 1840-1868," (2006) was written by Grace Palladino. During the Civil War anthracite from the coal region of Pennsylvania (especially in Schuylkill, Luzerne, and Carbon counties) was depended on by the Union Army to fuel steam powered factories, locomotives, and battleships. This book discusses the coal miners and the struggles they faced as a result of the social and economic impact of the war on their industry. •	HD8039.M62 U6497 2002 "Images of America: Early Coal Mining in the Anthracite Region," (2003) by John Stuart Richards, who comes from a family of coal miners, includes nearly 100 pages of pictures, with detailed captions included, of the daily life of miners including, roof falls, underground equipment, and much more. •	HD6515.M7 U7733 1972 "The Corrupt Kingdom: The Rise and Fall of the United Mine Workers," (1972) by Joseph E. Finley discusses the coal miners union and the role of John L. Lewis, president of the United Mine Workers of America, in the miners worker struggle. •	HD8039.M62 U6135 2003 "Coalcracker Culture: Work and Values in Pennsylvania Anthracite 1835-1935," (2003) by Harold W. Aurand. After a lifetime of studying anthracite coal mining, Aurand begins by looking at the coal regions industrial and social situation, the nature of the work, the consequences, and the lifestyle. He then turns to the values cultivated by the miners; their sense of freedom, physical toughness, and the love-hate relationship they had with their job. •	HD9547.P4 S555 2000 The film, "Silver Cinders: the Legacy of Coal and Coke in Southwestern Pennsylvania", (2000) produced by the Cultural Heritage Research Services, Inc. and Branch Valley Video Productions. The 56 min recording traces the history of coal mining and coke production in southwestern Pennsylvania, especially in Fayette and Westmoreland counties. The film also includes a commentary by and film from John Enman, Professor of Geography at Bloomsburg University. • TN805.P4 P65 1970 "When Coal was King : Mining Pennsylvania's Anthracite : Early Coal Mining in Picture and Story in the Land of the Mollie Maguires" (1970) by Louis Poliniak. The Molly Maguires were a secret society of approximately 20 Irish immigrants working in the coal region of Pennsylvania around the time of the Civil War. In the 1870s these men were convicted and executed for the murder of 16 mine employees. Since then, there has been much speculation as to who these men really were and their true guilt or innocence. The Molly Maguires left virtually no record of themselves; the only information known about them was recorded by observers and historians (who many believe have biased opinions on the topic). •	HV6452.P4 M6 1998 "Making Sense of the Molly Maguires," (1998) by Kevin Kenny (Assistant Professor of History at the University of Texas at Austin) combines social and cultural history to uncover who the Molly Maguires were and why people have the beliefs they do about them and their actions. •	HV6452.P4 M6 1876a "The Molly Maguires," (1969) originally published in 1876 by Eveland & Harris of Tamaqua, Pa was republished in 1969 by Kelly Printing Co. of St. Claire, Pa, during a renewed interest in the Molly Maguires. The book now includes excerpts of the report of the case of the Commonwealth vs. John Kehoe, et al, who was sentenced to be hanged in 1877 for his involvement in the Molly Maguire murders of coal miners. •	HV6452.P42 M67 1998 A film titled, "The True Story of the Molly Maguires" (1998) originally aired on the History Channel Series "In Search of History," and explores who the Molly Maguires really were. •	HV6452.P42 M65 1887 "The Mollie Maguires and the Detectives," (1877) by Allan Pinkerton. Pinkerton is famous for his detective agency, The Pinkerton National Detective Agency, but more so for his plan to assassinate Abraham Lincoln. Pinkerton was hired to investigate the labor unions in the Pennsylvania coal mines and his testimony was used against the Molly Maguires and is still some of the only evidence in the case. 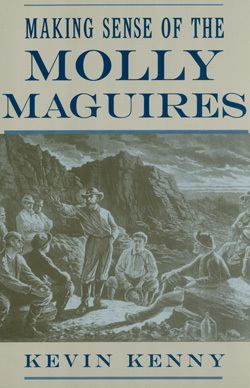 •	HV6452.P4 C76 2003 "A Guide to the Molly Maguires," (2003) by H.T. Crown and Mark T. Major includes a "tour" to guide the reader though Carbon and Schuylkill counties stopping at important Molly Maguire landmarks. In addition, the book serves as a guide to the major events, participants, mining, and other related issues to the Molly Maguire era. •	The Great Mollie Maguire Trials in Carbon and Schuylkill Counties, Pa., as reported by R. A. West, Pottsville, 1876. •	The Molly Maguires of Pennsylvania, or Ireland in America. by Ernest W. Lucy, London, 1882. All of these title and many more on Coal Mining and the Molly Maguires are available in the Andruss Library Special Collections, located in the University Archives area on the 3rd floor of the Harvey A. Andruss Library.